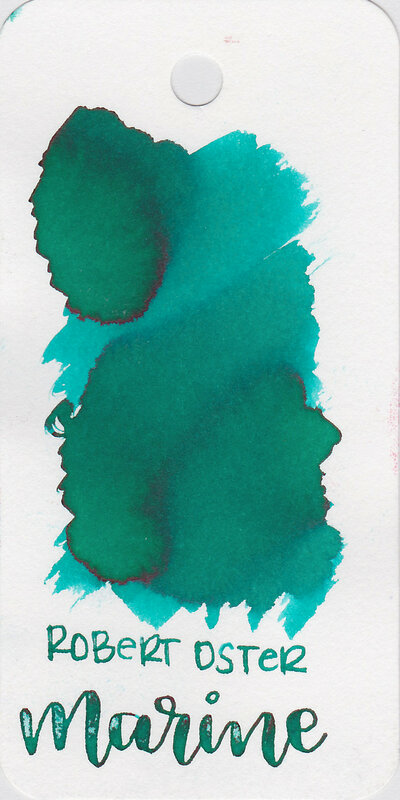 Teal inks are my favorite, and as soon as I swatched Robert Oster Marine, I knew it would probably become one of my top favorites. I purchased my samples of ink from Goulet Pens. Marine is a gorgeous teal with a medium green undertone. I love the pink sheen this ink has. Other properties: Medium shading, medium sheen, and no shimmer. Ink swabs for comparison, left to right (top to bottom for mobile RSS): Robert Oster Morning Mist, Robert Oster Marine, and Robert Oster Tranquility. Click here to see the Robert Oster inks together. Morning Mist is the lightest, then Marine, than Tranquility is the darkest. Marine has more green to it than either of the others. Robert Oster Aqua, Papier Plume Lake Michigan Summer, and Krishna Peacock. Click here to see the teal inks together. I used a medium Pelikan M605 White Transparent on Tomoe River paper. The ink had a nice wet flow. Overall, I'm a bit obsessed with this ink. It's one of my new favorites. I only have a sample, and a full bottle is now at the top of my wish list. Give it a try, you might love it.